The first QX4 was built in 1996, and after a series of face lifts and improvements, the series was discontinued in 2003. Today, the model can only be acquired via channels that sell used Infiniti QX4. 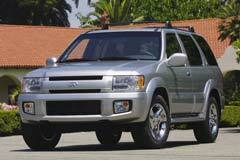 Known as a sport utility vehicle, the series was based on the Nissan uni-body frame. It featured a small front grill, large rectangular headlights and a large protective bumper. Its first major update arrived in 2000 with a brand new engine and a significant face lift. A new 3.5 liter engine was also introduced. Additional updates were brought in 2002 when a Cruise control was added. In 2003, multiple safety features were included in the standard package such as curtain-type side airbags. Also, the interior received new leather covers and the rims were upgraded to 17 inches. Finally, a new dashboard was designed as part of the visual improvement packages which included a new set of gauges and instruments.